The GHC140's crawler tracks easily navigate tough job site conditions, such as swampy or mountainous terrain, with its 57% gradeability track rating. Manitowoc has officially launched for North America its biggest Grove Hydraulic Crawler (GHC) crane, the new GHC140. It's the latest in a long line of telescoping crawler cranes with enhanced features and what the company states are best-in-class load charts. "The Grove GHC line has grown in popularity over the years due to its reliability on the jobsite and best-in-class features," said JJ Grace, Manitowoc's product manager for GHC cranes. "This latest model stems from discussions with customers who liked using our telescopic crawler cranes but needed improved load charts." 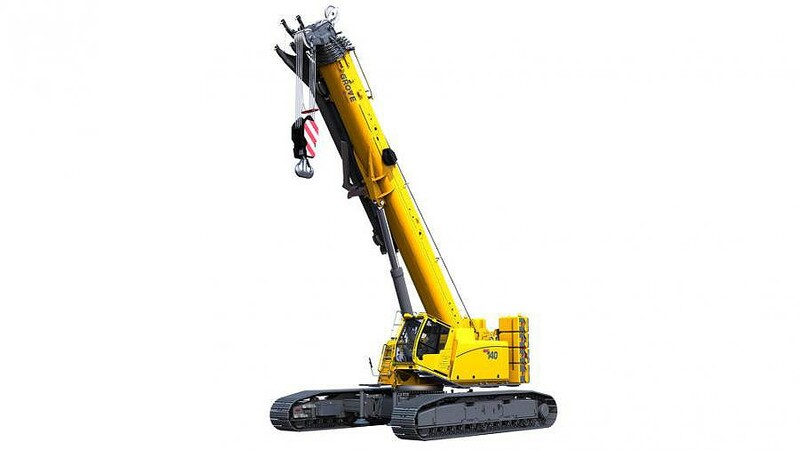 Companies with applications in utility work, alternative energy applications, tunnel construction, barge work and storage tank construction will find the crane especially useful, as it fits easily onto a variety of job sites. With its pin telescoping boom, operators can easily handle a variety of lifts at various radii. This enables users to reach greater heights than they could previously with other GHC models. The GHC140's crawler tracks easily navigate tough job site conditions, such as swampy or mountainous terrain, with its 57% gradeability track rating. The undercarriage is driven by powerful, two-speed hydrostatic drive motors that provide best-in-class mobility. The track side frames can be hydraulically extended and retracted, providing three track spans with lifting capabilities at each span. This provides added versatility to find the best combination of crane width and lifting capacity. Manitowoc has greatly expanded its service and support offerings and featured them at bauma 2019. The company called attention to a diverse portfolio of tools and services that bolster its crane and technologies lineup. When Jon Mihalic's last cable crane operator retired recently, he knew the time had come to also retire the aging Manitowoc 4000 crane from his barge dock. "You can't find a qualified cable crane operator anymore," he noted, "but really, that old crane just wasn't efficient by today's standards." In 2018, Manitowoc's factory in Niella Tanaro, Italy boosted production of Grove rough-terrain cranes to better serve customers in Europe, Africa, the Middle East and Asia-Pacific, and this enhanced capability is highlighted at bauma 2019. The company is showing two rough-terrain cranes at the exhibition, a 100 t capacity GRT8100 and a 51 t capacity GRT655L. The GRT8100 on show was built at the Italian plant while Manitowoc plans to start building the GRT655L there in future. The Terex RT 90 rough terrain crane offers a five section, fully hydraulic boom that extends to 47 m. A 17 m bi-fold jib further enhances the reach and versatility of the crane. Designed for easy operation, the Terex RT 90 features a control system with integrated diagnostics, a new ergonomic cab design with an 18-degree tilt and an easy to access flat deck for safety, superior usability and comfort. High load capacities with a long telescopic boom together with excellent global mobility are the main features of the new LTM 1110- 5.1 unveiled by Liebherr at Bauma. The new 5-axle crane achieves axle loads of 12 tonnes with 13.1 tonnes of ballast, but can also be driven with a gross weight of less than 48 tonnes with a maximum axle load of 10 tonnes. With its maximum ballast of 28.7 tonnes, it remains below an axle load of 15.5 tonnes. A quick-change system for the ballast slabs ensures maximum flexibility for modifications. The variable support base VarioBase delivers particularly high load capacities with its widened rear supports. Liebherr calls it VarioBasePlus. At bauma 2019 Manitowoc launched an impressive new unit in the five-axle category and two new three-axle models. Andreas Cremer, global product director for all-terrain cranes at Manitowoc, said the launch of the new models underlines the company's increased speed of product development under The Manitowoc Way and its ongoing commitment to building cranes that offer outstanding return on investment. Linamar Corporation's Skyjack division changed things up a bit at this year's bauma. The leader in aerial access took the show indoors and brought a taste of Canada with them to their first two-story indoor booth. With their new full-size rough terrain scissor lift at the helm and the first of their redesigned DC electric scissor lifts on stand, there was a lot of traffic to hall C4 to see what Skyjack had to offer. Where other cranes literally hit their limits, the Demag AC 45 City crane delivers. The 3-axle unit redefines compactness in the 45-tonne lifting capacity class with a total length of only 8.68 meters, a width of 2.55 meters, and an overall height of just 3.16 meters. The final piece of structural steel was recently installed at the Liebherr USA, Co. new headquarters building - a significant construction milestone. Work is on schedule for completion in 2020. The project will house Liebherr USA, Co. employees working in administration, finance, marketing, human resources, sales and service, product support, production and distribution for nine product units. Konecranes is focused on selling safety, and through its new online streaming service Live Channel, it is reaching customers one at a time, or through a scheduled group meeting. Prospects can schedule a live crane demonstration and ask questions through one-way video and two-way audio. Prior to the introduction of mobile elevating work platforms (MEWPs) in the 1970s, construction industry professionals relied almost exclusively on ladders and scaffolding to access major work at height projects. In the decades since their introduction, MEWPs have become increasingly common, but the question still surfaces: is a MEWP or scaffolding the right choice for my jobsite? Faresin Industries says that it is offering highly technological models to complete and upgrade its telehandler product range (Small range, Compact range, Middle range, Heavy Duty range, Big range), meeting handling needs. JCB is offering new options for its range of JCB Loadall lift-and-place telescopic handlers offered in North America. Genie booms and telehandlers are now available from the factory "rental-ready" for industries and applications requiring positive air shutdown, including uses on oil and gas, mining and indoor factory jobsites. To prevent diesel engine runaway in sensitive work environments, the new modern Genie positive air shutdown system meets the strictest jobsite requirements and global environmental standards. Already popular in other parts of the world, the new Demag® AC 45 City crane has now made its way to North America. CraneWorks, a prominent crane distributor throughout the United States and Canada has recently taken delivery of the newly introduced Demag crane. With an overall length of just 28.6 feet (8.69 m), a width of 8.4 feet (2.55 m) and a height of 10.4 feet (3.16 m), the Demag AC 45 City has the most compact dimensions in its class, and is well suited for working indoors, as well as in tight urban environments. As part of its bauma 2019 product lineup, Terex Aerial Work Platforms (AWP) will be showcasing the new Genie GS-4655 scissor lift. The latest addition to the brand's large electric slab scissor lift family, this new eco-friendly machine comes in a compact, lightweight package and combines maximized productivity with increased battery runtime and reduced service costs. Equipped with the latest generation of fully sealed AC electric drive motors for excellent efficiency, it is suitable to meet the demands of indoor and outdoor access tasks. This new model will be available globally in Q3 2019. Quebec equipment supplier Fraco Products Ltd. will be exhibiting at bauma in Munich, Germany, from April 8 to 14. JLG Industries is offering a new reversing camera for all SkyTrak brand telehandlers and the JLG G5-18A. Ideal for both day and night work, the system features a built-in microphone and speakers, allowing the operator to hear jobsite activity happening outside the cab. High-capacity telehandlers offer high lift and lifting capacity and are a more maneuverable option than cranes for moving and lifting materials around the jobsite. With a wide variety of attachments for handling materials from pipes to pallets, these machines are primed for work on construction sites, industrial applications, working in the oil and gas and mining industries, and stockpile management. JCB today launched the 504-13 Loadall subcompact telescopic handler in response to growing demand in North America for telehandlers in the sub-6,000-pound category. With a 4,000-pound lift capacity and maximum lift height of 13 feet 3 inches, the new JCB 504-13 telehandler is well-suited to maintenance applications, jobsite cleanup and material handling within confined worksites. JLG Industries, Inc. has added six-foot and eight-foot platform options for most JLG engine-powered boom lifts. The new platforms give both single and multiple occupants additional options to enter or exit. Skyjack activated an automated self-check from Australia for audiences in Anaheim at the ARA Show. The new SJ3215 was there to give audiences an idea of how Skyjack has been working toward a goal of autonomous functionality for the construction rental industry. Link-Belt Cranes will introduce the never-before seen 120|RT 120-ton (110-mt) rough terrain crane to the world at Bauma 2019 in Munich, Germany, booth number F903/3. Owners will appreciate their return on investment with this 120|RT for its true 120-ton lift chart and operating efficiencies, while operators will continue to reap the benefits of Link-Belt's continued crane design innovations providing greater efficiency and comfort. Custom Equipment LLC, an industry leader in high-quality, low-level access equipment, announces the next generation of Hy-Brid Lifts to better align with individual user needs. The line is being divided into three series – the Push-Around Series (PA Series), Pro Series (PS Series) and Zero-Turn Series (ZT Series) – to simplify the selection process. This includes a number of safety and productivity enhancements to the existing products, as well as the introduction of two new models: the PA-1030 and ZT-1630. Terex Cranes will officially launch the new 10-tonne (11-U.S.-ton) class Terex CTT 202-10 flat top tower crane at Bauma 2019. Delivering increased jobsite versatility, the new Terex crane offers three chassis options, budget to performance, with 3.8-m (12.5-ft), 4.5-m (14.8-ft) and 6-m (19.7-ft) base selections. the new crane can be configured with H20, TS21 and TS16 masts, offering from 1.6- to 2.1-m (5.2- to 6.9-ft) widths, so customers can efficiently manage component inventory while cost-effectively meeting tower height needs. Following Terex Corporation's release of its fourth quarter and full year 2018 results, Terex Cranes is pleased to share these, along with its segment-specific, results. The Terex Corporation is announcing that it has agreed to sell its Demag Mobile Cranes business to Tadano Ltd. for an enterprise value of approximately $215 million. The Demag Mobile Cranes business manufactures and sells all terrain cranes and large crawler cranes. Included in the transaction are the manufacturing facilities in Zweibrucken, Germany and multiple sales and service locations. The sale, which is subject to government regulatory approvals and other customary closing conditions, is targeted to close in mid-2019. Currently available for the 1644 and 1732 high capacity telehandlers, SmartLoad Technology - featured by JLG Industries, Inc. at the ARA Showin Anaheim, California - will be available as an option on all JLG telehandlers over the next 12 months. SmartLoad is an advanced bundle of three integrated technologies that work together to increase operator confidence and optimize productivity. This award-winning system includes automatic attachment recognition, a load management information system and a load stability indicator. Skyjack has displayed their newest rough terrain scissor lift to The ARA Show in Anaheim. The SJ9253 RT is Skyjack's largest scissor lift to date with a working height of 59 feet (17.98 m) and is the first model in the industry leader's new full size rough terrain range. This new range replaces Skyjack's existing 88" and 92" models and consists of the SJ9233, SJ9243, SJ9253, and SJ9263 RT. Tower crane manufacturer COMANSA will be displaying its latest high capacity crane at Bauma. The 21LC1050 flat-top crane can load up to 50 tonnes (110,230 lb), has a maximum radius of 80 metres (262.4 ft), and was designed to provide great performance in large industrial or infrastructure projects as well as in construction with heavy precast or steel structures, including PPVC. Whether an air-conditioning system is to be lifted on a high-rise roof or whether it is a question of extremely heavy parts of bridges or wind turbines—wherever loads have to be lifted and positioned with great precision, mobile and crawler cranes from Liebherr-Werk Ehingen GmbH are used. The approximately 3,600 employees in the company produce around 1,800 machines every year. The diversity of variants is huge. The current product range includes forty different crane types which were developed by roughly 300 engineers. Every customer, every application, every country has its own requirements of the complex machines. The cranes manufactured in Ehingen can be roughly divided into two product lines. On the one hand, there are the wheeled mobile cranes, which include all-terrain mobile cranes, compact cranes, truck-mounted cranes and rough-terrain cranes. On the other hand are the crawler cranes with lattice jibs or telescopic booms. The most powerful crawler crane towers over the famous Ulm Minster church located a stone's throw away from Ehingen. It is 240 metres high and lifts loads up to 3,000 tonnes. Marking its entry into the 12,000-pound capacity market, Pettibone has introduced the Traverse T1258X telehandler. The new Traverse model becomes part of the industry's only new telehandler product line with a traversing boom carriage that can move loads by travelling horizontally. By providing up to 70 inches of horizontal boom transfer, the Traverse allows operators to safely place loads at full lift height without needing to coordinate multiple boom functions. Manitowoc Cranes will launch an upgrade of the three-axle Grove GMK3060 all-terrain crane at bauma 2019 in Munich. The new GMK3060L is based on its predecessor's design but has a longer boom (157.5 ft/48 m instead of 141 ft/43 m) and offers the strongest taxi load charts in its class. Developed in direct response to rental customers' unique business needs, the new Genie Lift Connect program is a telematics offering focused on actionable information, flexibility and transparency. No matter what size of aerial equipment fleet – from 10 to 10,000 machines – equipment management is something that rental stores do every day. From knowing how equipment is performing or how often a piece is being utilized to where each unit is or when it is ready for maintenance, machine data can provide a lot of insight to rental businesses. Genie Lift Connect solutions will be available in North America in early 2019, in EMEAR (Europe, Middle East, Africa and Russia) by mid-2019 and globally in 2019-2020. Cropac Equipment is adding seven new Terex Crossover 8000 boom truck cranes to its equipment inventory. As a top performing Terex Cranes distributor, Cropac has received significant interest from customers for versatile boom trucks and the Terex Crossover 8000 model is the preferred unit for many of those contractors. The new boom truck cranes will be available at Cropac's locations in Ontario, Québec and Alberta, Canada. The world is changing; rental businesses are using data to operate faster and more efficiently than ever before. As time goes on, data will become more and more powerful in the rental industry. To help rental stores better understand how data can create value and drive business growth, Genie invites customers to ask questions and get answers about accessing, utilizing and leverage data during its upcoming "Ask Me Anything" (AMA) event, January 29 to February 1, 2019. The event will start with a special announcement on January 29th at 1:00 p.m. ET/10 a.m. PT, streaming on the Genie Aerial Pros AMA Event page, with the AMA following immediately after. Ahead of this event, Genie encourages customers and key stakeholders to watch a brief video presentation, which can be accessed through the Genie AMA Event Presentation.